Granville Island with all its boutiques, public food market, marina, cafes and restaurants, is a must-see for tourists visiting Vancouver. It's also a great place to take the kids if you're a local, and it's definitely one of my family's favorite spots around town. Here are 12 things we love to do on Granville Island. 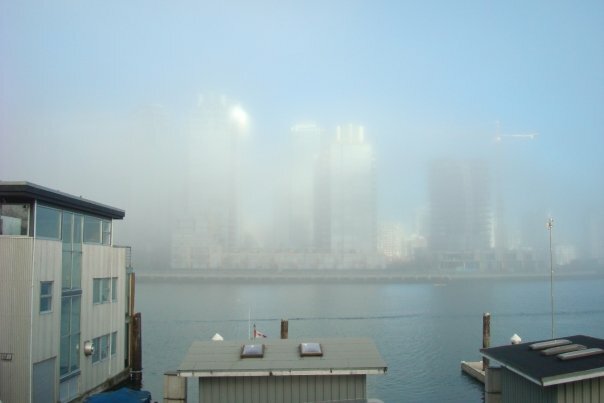 View from Granville Island, on a foggy day. 1. Visit the Kids Market - This building is full of very cool shops for kids: kids' clothing, toys, puppets, shoes, crafts of every kind. Some of the shops are a bit pricey, but many also carry items that are worth the extra dollars. There's also an indoor playground with slides, climbing equipment and more. 2. Walk around Granville Island - There's a walkway that goes around Granville Island and gives a nice view of False Creek, downtown, and the marina. On a sunny day it makes for a great walk and some nice photos. 3. Stop at the playground & water-park - Last time I checked out Granville Island's playground with the kids, most of it was cordoned off. Apparently it's undergoing some major renovations and will open again with a lot of new, fun equipment. Right next to the playground is the water-park, which makes for a fun stop in the summer. 4. Browse the rocks and minerals at Crystal Ark - This shop is located right across from the Kids Market, by the pond. If your kids (or you!) are at all into geology, fossils, rocks, shiny stones or anything like that, then this place is well-worth a visit. 5. Buy dinner & dessert - The Public Market has some fantastic produce: everything from vegetables, fruit and berries, bread and pastries, olives and soups, to shellfish, fresh pasta and meat. It's a lot of fun to go shopping for some groceries to bring home and make a meal out of. 6. Have some food or a snack - The food court in the Public Market is a fantastic place to go for a meal or a snack: as long as you can find a table to sit down at! There's a wide variety of foods available: Mexican, Greek, Japanese, Chinese, Ukrainian, Indian... and burgers and pizza too. Restaurants like Bridges and The Keg are great choices too. Prices can be higher than off Granville Island, but it's worth it for a treat. 7. Go for ice cream - There's several places to go for ice cream on Granville Island. Our favorite place for coffee, tea, baked goods as well as ice cream is GI Gelato & Coffee House in Creekhouse. 8. Enjoy the scenery - Watch the water as the boats go by, listen to buskers playing music and watch the street performers do their thing. Let your kids freak out and get freaked out by the sea gulls. Hang out on a bench in the sunshine. These are just some great ways to enjoy Granville Island for free. 9. Head into Dragonspace - This boutique in Creekhouse is stuffed to the brim with all sorts of dragons, fairies, Celtic symbols, and other weird and wonderful things. I avoid this place usually because my kids have very busy fingers, and there are a lot of breakable items, but if your kids are older (or calmer!) than mine, then this is a sweet spot to visit. 11. Try on hats - Edie Hats, located in the building called The Net Loft across from the Public Market, is a very cool little store. You can find hats of every kind (and then some!) in here. 12. Experience Native arts & crafts - Native art and crafts can be seen and purchased at several stores on Granville Island, for example Wickaninnish Gallery. There is also a space near Creekhouse where Native carvers work on things like canoes, totem poles, and wooden sculptures. If you're lucky, you will catch some of the craftsmen in action. Otherwise, you will at least be able to see some of their works in progress.